Only relatively few controls can be placed on or around the steering wheel. Many are still located in the central dash area, between driver and the front seat passenger. Movement analysis is an important part of touch screen and control hardware interaction analysis. It enables our team to assess muscular fatigue and distraction levels induced in the driver. 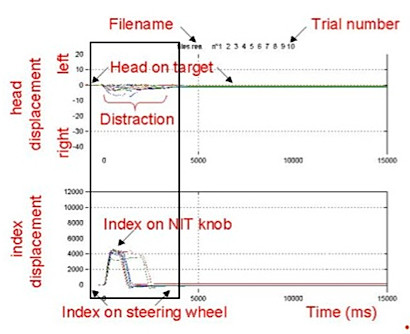 It is possible to understand to what degree a driver understands the commands when a number of movements are studied in unison. For example co-ordination between head and arm movement will indicate that the user understands the command and generally execute with in the 1.5 to 2.0 second glance away time limit. For example in a project for Maserati given that the age profile of the owner was estimated to be over well 45 years. A careful analysis was undertake to study the head & arm movement co-ordination of drivers ages 45, 55, 65 & 75 to see if the centrally mounted Sat Nav. would cause excessive difficulty or distraction.